Black Beauty is a very popular variety with reliable production, good texture and a rich flavour. This vegetable grows on small bushes to 1.5 m tall with large, coarse, hairy, grey -green leaves. The star-shaped flowers are an attractive mauve colour. The plants produce approx. 8 fruit per bush. The fruit are large, egg shaped with a deep, dark purple almost black colour. 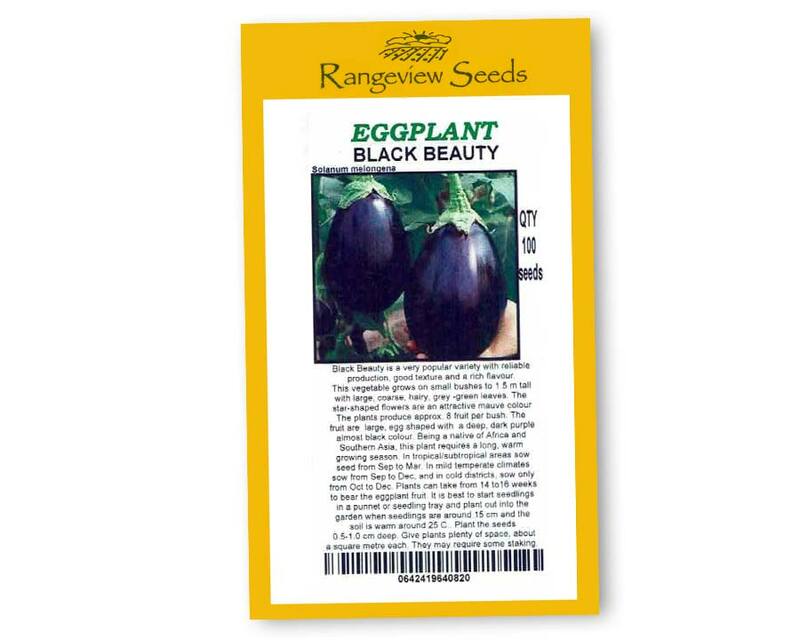 Being a native of Africa and Southern Asia, this plant requires a long, warm growing season. In tropical/subtropical areas sow seed from Sep to Mar. In mild temperate climates sow from Sep to Dec, and in cold districts, sow only from Oct to Dec.
soil is warm around 25 C.. Plant the seeds shallowly, 0.5-1.0 mm deep. Give plants plenty of space, about a square metre each. They may require additional staking.